Due to this postponement, Christ explained the spiritual conditions that would prevail during the kingdom's absence. This interim program includes His revelation of the kingdom mysteries and the church. Because neither represents the fulfillment of God's Old Testament kingdom promises, the kingdom will remain in a state of abeyance as long as God's present work in the world continues through His interim program. However, one day the church's mission on the earth will be completed resulting in the church's removal from the earth through the rapture. Then God, who is not forgetful of His prior unconditional covenants with Israel, will re-extend the offer of the kingdom to national Israel in the midst of the coming Great Tribulation. Unlike at the First Advent, this time the offer will be accepted leading to Christ's return and subsequent earthly kingdom. Revelation explains how the world will eventually transition from the rule that Satan has had over the world ever since the Fall in Eden to the future time in history when God and His people "will reign upon the earth" (Rev. 5:10b; 11:15b). The Apocalypse furnishes the important detail of the Messianic kingdom's duration, namely one-thousand years (Rev. 20:1-10). God's kingdom program will extend beyond Christ's one-thousand year earthly reign as it transitions into the Eternal State (Rev. 21-22). In addition, we began scrutinizing a series of texts that "kingdom now" theologians routinely employ in order to argue that the kingdom is a present spiritual reality. We began with the use of such alleged "kingdom now" texts in the life of Christ. We noted that the expression "Repent, for the kingdom of heaven is at hand" merely communicates that the Old Testament expectation of an earthly kingdom had drawn near in the person of Christ. Had the nation enthroned Christ (Deut. 17:15), what the Old Testament predicted concerning an earthly kingdom would have become a reality not only for Israel but also for the entire world. As long as Christ was present amongst first-century Israel offering them the kingdom, it was in an imminent state of nearness. This reality is an entirely different matter from saying that the kingdom was present or had arrived. We also observed that Matthew 6:9-13 is in actuality a model prayer for the disciples consisting of three requests for the kingdom to come and three additional requests for their temporal needs to be met prior to the kingdom's establishment. Such a framework makes it obvious that the Lord did not establish the kingdom at His First Advent. Fifth, there is a cessation of the announcement of the kingdom after Israel rejects her Messiah (Matt. 12; Luke 11). Sixth, the Lord pronounces judgment upon that generation (Matt. 23:36-39) for failing to recognize the hour of their visitation (Luke 19:42, 44; Dan. 9:26). In other words, they were judged because they failed to accept the offer. Seventh, the parables of rejection depict the postponement of the kingdom. While earlier in Luke’s gospel the kingdom is portrayed as being near (Luke 10:9, 11), the parable of the minas was told in order to dissuade the disciples’ expectation of the kingdom’s nearness (Luke 19:11). The parable teaches that the kingdom program would be postponed for a long duration and the disciples had obligations to fulfill in the interim (Luke 19:11-27). 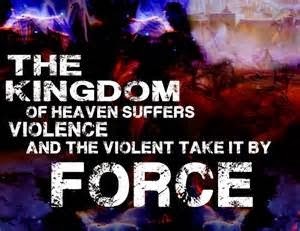 Eighth, the message of the kingdom’s imminence does not reappear until the context pertains to the Seventieth Week of Daniel or the future Tribulation period (Matt. 24:14; Luke 21:31). In sum, when understood in the light of this kingdom offer, Christ's statement in Matthew 12:28 was not indicative of the fact the kingdom had arrived. Rather, His statement simply meant that the tokens of the kingdom (His miracles, exorcisms, etc...) could have become a reality for the nation of Israel had she responded to the contingency of the offer that Christ was extending to her. While still holding to some form of a future earthly reign of Christ, inaugurated eschatology advocates maintain that the kingdom is still a present spiritual reality with Christ presently orchestrating it from David's Throne in heaven. Craig Blaising, "The Kingdom of God in the New Testament," in Progressive Dispensationalism (Wheaton, IL: Victor, 1993), 248. See parts five and six in this series for a fuller development of this concept. Stanley Toussaint, "The Contingency of the Coming Kingdom," in Integrity of Heart, Skillfulness of Hands: Biblical and Leadership Studies in Honor of Donald K. Campbell (Grand Rapids: Baker, 1994), 225, 232-35. Stanley Toussaint, Behold the King (Grand Rapids, Kregel, 2005), 153.